There are some creatures that are so bizarre that they leave me baffled as to why they are the way they are. This is one of them. 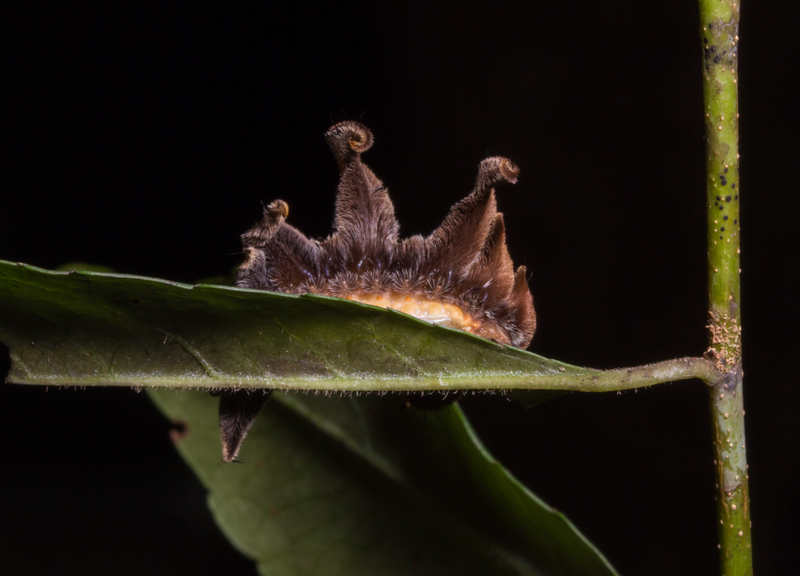 Even the name is a mystery – Monkey Slug. I suppose if you squint and look at it, you could imagine a very hairy cartoon-like monkey with a few extra arms. One reference said it resembled a terrestrial octopus. That I can see. 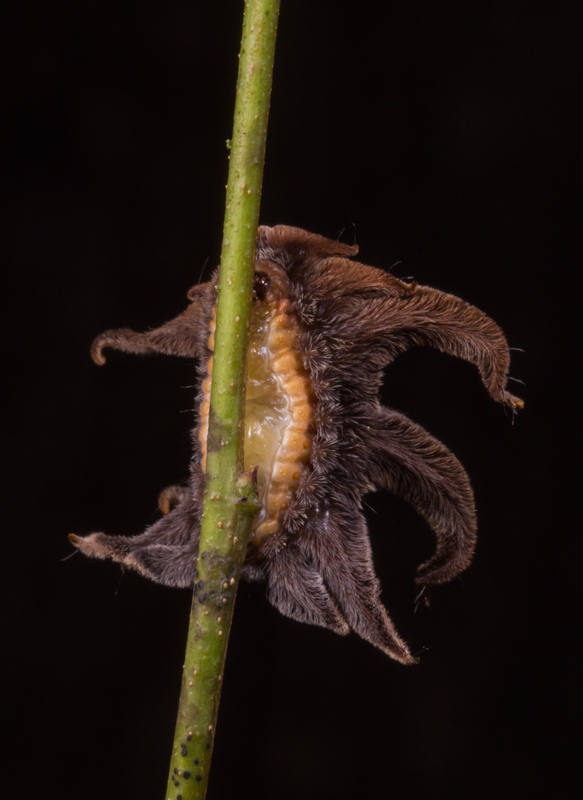 And the Hag Moth part probably comes from the likeness of the hairy arms to an old witch’s disheveled hair. 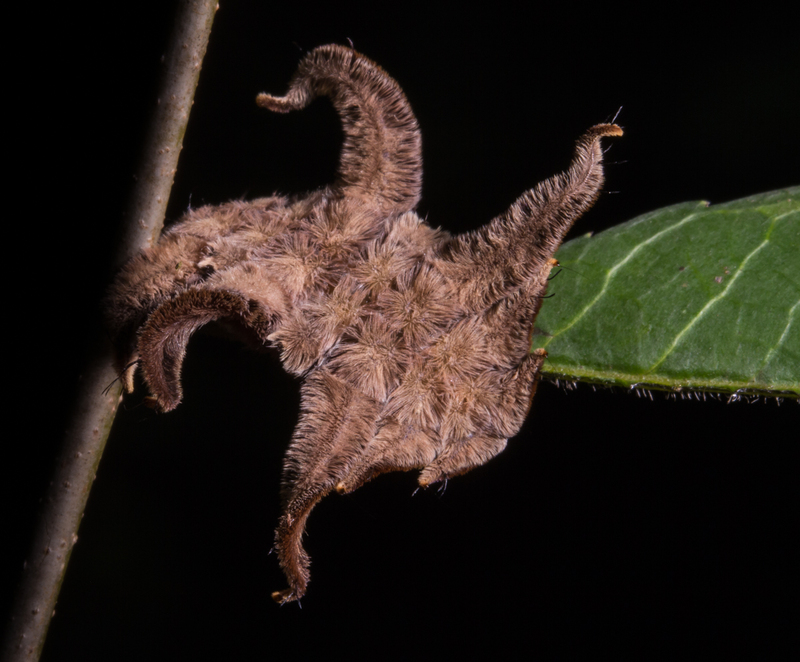 But, no matter how you look at it, you probably would not guess this strange-looking bug is a caterpillar. It belongs to the slug caterpillar family, Limacodidae, many of whom are so-called stinging caterpillars, due to the presence of urticating spines. 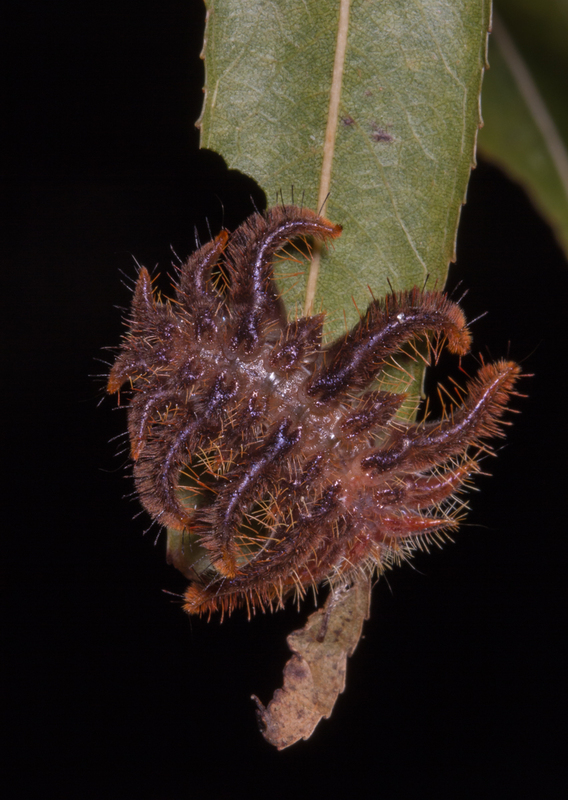 There is disagreement in the references on this species’ stinging ability, with the guru of caterpillars, David Wagner (author of Caterpillars of Eastern North America), stating that he has been unable to get this species to “sting” even by rubbing it on his arm. Others say that people vary in their susceptibility, so I will let it go untested. They certainly look like they could hurt you, with a dense coating of short hairs and long spines, especially in the earlier stages (instars). As they grow and molt, they take on a more carpeted appearance, with short, stiff, brush-like hairs, densely covering their dorsal surface. Monkey Slugs are characterized by six pairs of arms (some short, some long) that are deciduous and can break off without any apparent harm to the critter. 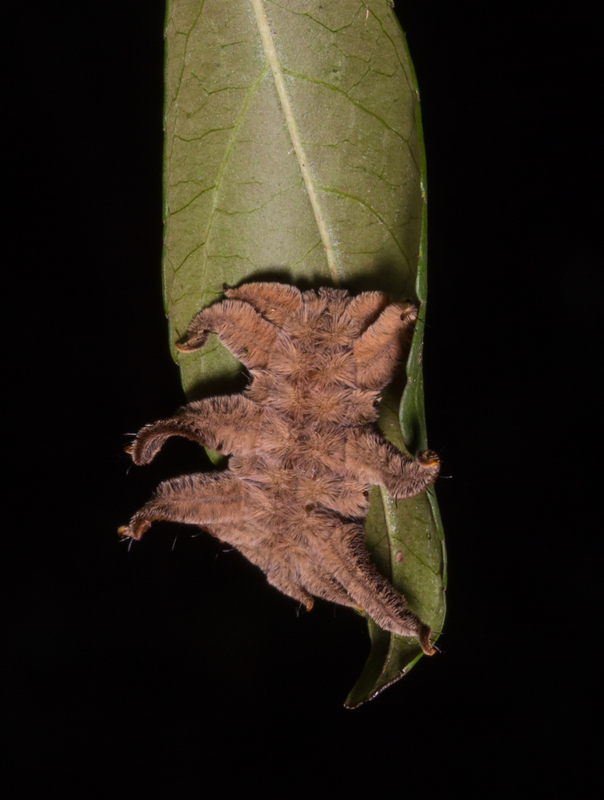 To my eye, a Monkey Slug (especially the last instar) resembles a dead leaf with curled edges. Some researchers have speculated that it looks like a tarantula shed, which also has urticating hairs. Many of our insect eating birds migrate to the tropics and thus might encounter these distasteful objects in the forest, which would then give a tarantula shed mimic some advantage, but who knows. I have never found an adult, but they, too, are mimics – the male looks like a wasp, and the female has the likeness of a bee, complete with faux pollen sacs on her legs. I have only seen a few of these caterpillars over the years, but two of my former colleagues at the Museum each found one and brought them to BugFest last week, where they drew lots of curious looks and questions from the hundreds of visitors wandering by our booth. Monkey Slugs can be found on a wide rage of shrubs and trees but may be relatively scarce, or just darned hard to spot in vegetation. 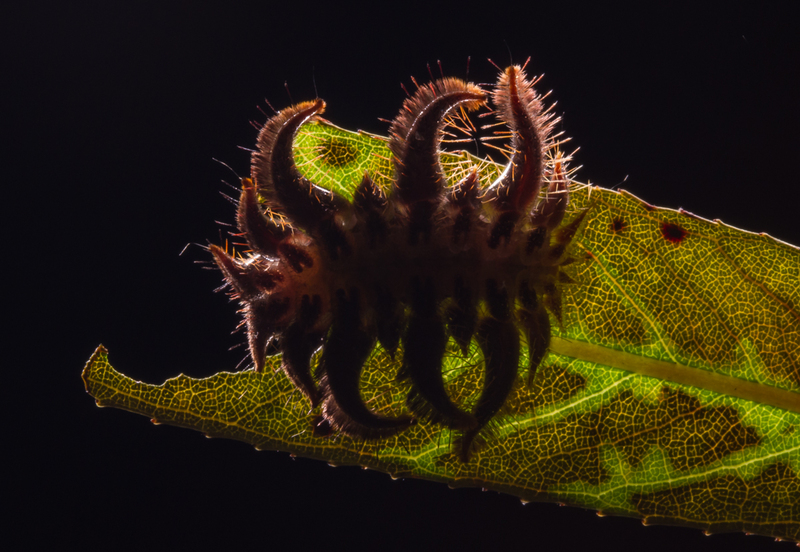 This entry was posted in Natural History and tagged hag moth caterpillar, monkey slug by roadsendnaturalist. Bookmark the permalink. Wow! never ever seen one of those. thanks for sharing!! I found one of these strange caterpillars on my trash can underneath a bradford pear tree in Middle Tennessee. I took pictures & sent it to the local extension office & they believe this is what I had found. I wasn’t sure what to do with it, so we kept it in a jar & watched it mutate. Eventually all the top came/fell/shed off an the orange/yellow part on bottom became an orange caterpillar about 1/2″ long. Interesting. I still have one and am hoping to see it pupate, so I will keep an eye out for that…perhaps they shed their outer coating before getting ready.